The first volume in the Void Trilogy, Hamilton’s follow-up to Judas Unchained, returns to the Commonwealth after almost a thousand years have passed since the Starflyer War. In the millennia since the end of the Commonwealth series the human race has expanded and divided into different groups. The old core of the Commonwealth has taken full advantage of technological development to establish the so-called Higher civilisation, a utopian post-scarcity civilisation ruled over by the minds of ANA – essentially a giant computer network running the simulated minds of uploaded humans. Meanwhile, the newer colonies of the External Worlds remain suspicious of the technological obsessions of the Higher civilisation and exist in a state more akin to the Commonwealth in the original books, with a wide and varied range of cultures. Human starships have explored much of the galaxy and found a number of new and strange things, principal among them the Void that lies at the centre of the galaxy. The novel’s prologue begins with Inigo, a relatively undistinguished External Worlds citizen with a few secrets to hide from, arriving at Centurion Station – a multi-species observatory established over a millions years ago by the alien Raiel to observe the Void. The Void is an impenetrable barrier surrounding the stars at the centre of the galaxy which periodically expands, devouring nearby star systems. The Raiel fear that one day it could engulf the whole galaxy. Shortly after Inigo arrives on the station he begins to dream, but he does not dream ordinary dreams. Instead he dreams of the Waterwalker, a man living in a human civilisation on a planet inside the Void. The main part of the novel starts a couple of centuries later, when the Living Dream movement who believe Inigo’s dreams show the reality of a potential paradise inside the Void have become one of the biggest political forces in the External Worlds with millions of adherents and the control of several planetary governments. As the story begins they are celebrating the election of Ethan as their movement’s leader – a man who declares that the Living Dream movement will finally make its long-awaited pilgrimage into the Void. This causes great consternation among much of the Commonwealth - while the Living Dream movement is entitled to act on its own beliefs, the Raiel have repeatedly warned that any attempt to enter the Void will trigger another period of expansion. The Commonwealth-set part of the book is fairly traditional Hamilton space-opera, filled with ideas and with a large cast of characters on different planets all on their own missions that will, inevitably, all end up in the same place. The main characters include Aaron, an agent who doesn’t know who he is working for, who has no memory of his past but possesses an implacable sense of purpose and a huge armament of weaponry. Aaron is on a quest to track down Inigo, who ran away from his movement decades ago with Inigo’s former lover providing reluctant help. A parallel quest follows expert detective Paula Myo (one of the returning characters from the original books) as she recruits unlikely help to track down the so-called Second Dreamer, a successor to Inigo who also dreams of the Void, but without knowing that their dreams are real. Meanwhile, Troblum, an expert physicist with a definite lack of social skills and an obsession with the Starflyer War is recruited to help one of the ANA’s factions develop some secretive new technology. Much of the rest of the book focuses on the feuding between the different political factions inside ANA – particularly between the Conservatives reluctant to let the Living Dream movement spoil the Status Quo and the Accelerators who see an opportunity to speed up the pace of human development. As well as the Commonwealth-set part of the book, the other half of the book focuses on the world Inigo dreamed of – following the early life of the Waterwalker on the planet Querencia inside the Void. Querencia is a low-technology world that has not developed far beyond the Middle Ages, populated by humans with unique mental powers which allow them to use telepathy and telekinesis. Edeard is a young man with a bright future, an apprentice in the local Eggshapers guild (who use telekinesis to sculpt the embryos of animals to design the adult creature with useful characteristics) in a small farming village on the edge of the Wilderness. After a devastating raid on his village by bandits with unusually advanced technology for the planet he is forced to flee his home, eventually ending up in the planetary capital of Makkatharan. Finding himself lost with no contacts in the city he is forced to give up on his ambitions in the Eggshapers Guild and instead joins the city’s Constables in an attempt to earn a living fighting the seemingly hopeless fight against the city’s powerful criminal gangs who control large parts of the city’s commerce. It could have lead to a fairly undistinguished life, but he gradually becomes aware that he is not just mentally stronger than his colleagues or fellow citizens, but has unprecedented mental abilities. The novel’s two plots are an unlikely combination of post-Singularity Space Opera and quasi-medieval Epic Fantasy. Surprisingly, given Hamilton’s past record as a writer of Space Opera, it is actually the Epic Fantasy part of the novel that is more compelling. Edeard is an interesting and likeable character and although this part of the novel does use more than a few Epic Fantasy clichés (Edeard is an orphan destined for great things, with a wise mentor figure and a rural upbringing) it features an interesting plot, good characterisation and some fascinating world-building with a fairly traditional pre-industrial human civilisation surviving on an undeniably alien world – the most obvious alien-ness being the city of Makkatharan itself, a city of living rock designed for alien inhabitants. The Space Opera parts of the novel are often interesting, but suffer for being a bit unfocused with a lot of small plot threads, of which only Aaron’s quest builds up any real momentum. Troblum’s thwarted physics projects or Araminta’s attempts at becoming rich through property development are obviously destined to lay the foundations for important developments later on but at this stage in the series those plot threads are frankly a bit dull at times. The Space Opera part of the book also suffers from the fact that not a huge amount seems to have happened until fairly near the end of the book, it may have set up an interesting foundation for the later books in the series, but it is mostly build-up with very little being resolved. In contrast, Inigo’s dreams of the Waterwalker are well-paced and focused, with the novel ending as Edeard takes an irrevocable step to being more than just a simple constable with an unusual upbringing. As ever with Hamilton there are plenty of interesting Science Fiction concepts and world-building scattered throughout the book, and he does largely manage to stop the post-Singularity civilisation of the Highers being either too incomprehensible or unbelievable. There isn’t much in the way of explanation for the technological developments, but most of it does seem superficially plausible. Although the plot is (so far) largely unconnected to the first Commonwealth series, there are numerous references to the original books, including a large number of cameos from characters from the original duology. Arguably, Hamilton probably overdoes the cameos a bit, while it is nice to find out what happened to many of the main characters from the previous series it does seem a bit contrived that just about every plot threads seems to have some connection to the main players in the Starflyer War. The large number of references to the previous series also means that while the plot itself is fairly stand-alone there are possible too many things that wouldn’t make sense without reading the previous series first. Overall the characterisation is fairly good, although the characters inside the Void (particularly Edeard) get better character development than most of the characters outside the Void. Araminta is probably the most interesting of the Commonwealth characters (despite her largely dull and predictable plot-line), with a lot of the Commonwealth characters, such as Ethan or the Delivery Man, getting little time to really develop. 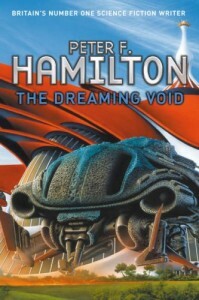 In summary, this is another good book from Hamilton, although surprisingly the novel’s entertaining Epic Fantasy plotline is better-written than the reasonably good but slightly underwhelming Space Opera section of the book, the difference being significant enough that this might have worked better as a straightforward Fantasy novel. When finished the Void Trilogy could be one of Hamilton’s best, but so far it has potential but hasn’t realised all of it yet. I’m a big fan of Hamilton and Sci-fi in general. Unusually for me though, I found myself enjoying the fantasy storyline and the character of edeard to be a wonderful creation. So much so that I’d like to re-read just those parts again. Can you recommended any fantasy novels that are similar? I’ve read lord of the rings but not a lot else in fantasy. Ideally it would be somewhat grounded (less about dragons or elves etc) but am open to suggestions. I did like Hamilton’s take on Epic Fantasy, I think it would be interesting to read a pure Epic Fantasy story without any SF elements by him sometime. As for a fantasy recommendation I might suggest Scott Lynch’s “The Lies of Locke Lamora” (and sequels). The writing style is a bit different to Hamilton’s, but like Edeard’s story in the Void books it is partially a coming-of-age story set in a city once inhabited by a now-vanished civilisation. It doesn’t have any elves or dwarves and although magic does play an important role in the plot it does avoid most fantasy cliches. I did think it was one of the best fantasy novels I’d read, the two sequels published so far are also good although I think the first book is still the best in the series.